Ryerson’s Digital Media Zone (DMZ) is partnering with Waterloo’s Communitech and Toronto’s OneEleven to share their facilities, resources and talent. Communitech and OneEleven, like the DMZ, help entrepreneurs grow their businesses. If a Ryerson-based startup needs to meet a client in Waterloo, they now have a space to do so. The agreement, announced Monday, means that entrepreneurs from each group will be able access the other groups’ spaces, cutting down on commuting time and making collaboration between the Toronto and Waterloo incubators easier. Brendan Dellandrea, DMZ’s director of marketing and communications, said the vision behind the partnership to to simplify the process for entrepreneurs who travel between the two technology hubs. “It allows us to open up doors and allows our entrepreneurs to immerse themselves in different environments and get access to other potential collaborators,” Dellandrea said. Chris Plunkett, Communitech’s director of external relations, said that they’ve been working with the DMZ to create tighter links between Toronto and Waterloo’s startup technology ecosystem. 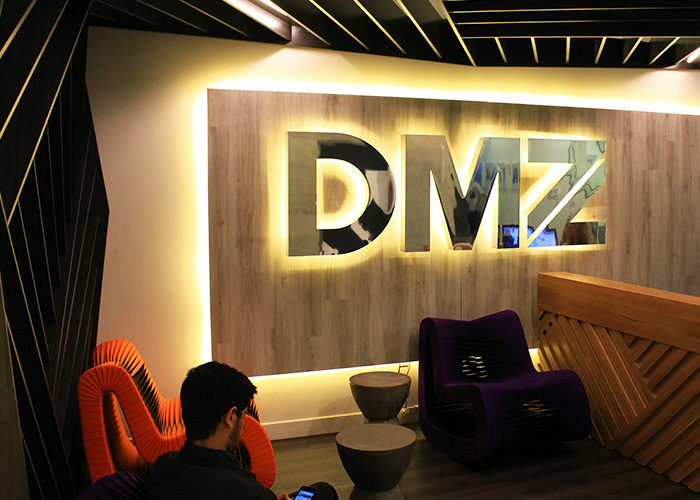 Located in Ryerson’s downtown campus, DMZ’s start-ups are able to access student talent Dellandrea said. Waterloo, on the other hand, is known for its engineering and computer science assets, which are also vital for start-up companies. Having access to potential collaborators — such as mentors or business partners — is one of “the biggest challenges (for) someone who’s looking to join or create a start-up,” Dellandrea said. He also hopes the partnership will increase efficiency. Brittany graduated from the Ryerson School of Journalism in 2015.